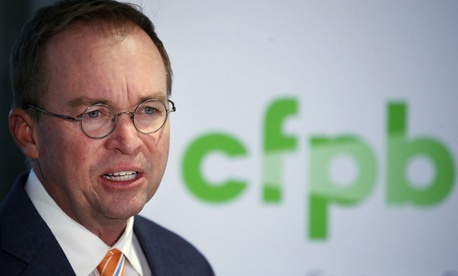 The Consumer Financial Protection Bureau is minimizing the significance of acting Director Mick Mulvaney’s just-announced move to consolidate the bureau’s office focused on student loan issues within its larger consumer education division. As reported on Wednesday by The New York Times, a Mulvaney email to staff is part of a larger effort to shift the controversial agency’s priorities from tough enforcement against abusive lenders to educating consumers about their legal rights. The reorganization, unnamed career employees told the newspaper, could “sidetrack” a key enforcement case being pursued against the large collection company Navient, which is defending itself in court against charges it misled students on their rights to refinance loans. The Times noted that Mulvaney’s move on the student loan functions left unchanged similar offices, such as one that protects military service members against debt fraud. “Among the bureau’s career staff, the shift was regarded as a new attack on one of the bureau’s core statutory functions, and another attempt by Mr. Mulvaney and his team to dismantle a consumer watchdog reviled by President Trump,” the reporters wrote. Consumer activist groups accused Mulvaney of working in tandem with Education Secretary Betsy DeVos to ease regulation on large student loan services. DeVos last fall canceled CFPB’s long-standing partnership with the Education Department in receiving data on complaints against student loan companies and collections firms. The groups argued that the bureau’s Office for Students and Young Consumers has helped return $750 million to student borrowers, and highlighted more than 50,000 complaints.